New review concludes omega-3 fats have no benefits for heart health… or does it? An extensive detailed analysis of the current scientific evidence into omega-3 seems to have thrown a spanner in the works for heart health dietary advice. Conducted by Cochrane, the review concludes that there is no correlation between cardiovascular health and intakes of the long chain omega-3 fats eicosapentaenoic acid (EPA) and docosahexaenoic acid (DHA) over a one- to six-year period. Long chain omega-3 fats have long been associated with reductions in blood triglycerides, blood pressure and thrombosis; producing anti-inflammatory and anti-arrhythmia effects as well as improving endothelial function and insulin sensitivity. This most recent publication will raise many eyebrows within the heart health professional arena and likely to be taken up by media editors who seem to enjoy questioning the trustworthiness of public health guidelines. These recommend a diet including omega-3, especially found in oil-rich fish such as salmon, tuna and mackerel. 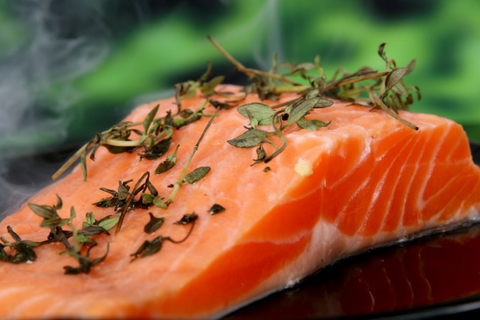 So, do we need to change dietary guidelines on the importance of omega-3 and oil-rich fish? a. The studies investigated in this review predominantly used omega-3 supplements. Thus the outcomes cannot be related to oil-rich fish consumption which is the main dietary source of EPA and DHA. b. The studies were also of one to six years’ duration, which is a relatively short period to assess disease and mortality risk. And conclusions cannot be reached for a lifetime consumption of foods rich in EPA or DHA. c. Many of the studies may not have used adequate number pf subjects in the studies to elicit a result. This is especially the case for studies conducted in healthy individuals (and therefore low risk of heart disease), which would require very high numbers to demonstrate a difference in the omega-3 and non-omega-3 study groups. d. Any studies conducted over the last two decades of people at risk of cardiovascular disease (CVD) will be in individuals already medicated with statins and other cardio-protective drugs, which may mask the effect, if any, of additional omega-3. 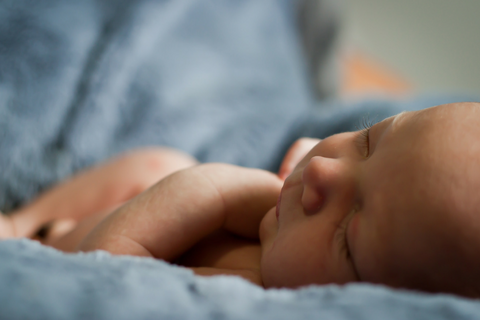 Long chain omega-3 fats are critical for eye and brain development of the foetus and young children. Therefore, food sources should be included in a healthy balanced diet of children and adults planning for a family. 3. Oil-rich fish is not just omega-3. It offers so many health benefits. a. Unlike omega-3 supplements, oil-rich fish is a rich source of not only the long chain omega-3 fats but also of selenium, zinc, vitamin D and iodine; woefully lacking in the UK diet. Indeed, the authors themselves remind us of the other nutritional benefits of oil-rich fish and that this review does not negate public health advice that consuming oil-rich fish is beneficial to health. Taking vitamin and mineral supplements as a substitute for eating a healthy balanced diet has never been encouraged by health professionals. However, dietitians recognise that when demands for specific nutrients are high, or when an individual’s nutritional intake is at proven risk of being compromised, supplements can play an important role. For example, pregnancy and folic acid; under-5 year olds and vitamins C and D; or sufferers of osteoporosis and calcium and vitamin D.
Therefore, these findings do not come as any surprise: omega-3 supplements are not a solution to better heart health. There are numerous dietary and lifestyle factors that impact on heart health. It should always be about food rather than the benefits of single nutrients. As Linda Main, Dietitian and dietary advisor for cholesterol charity HEART UK, explains: “We continue to advise the lifelong consumption of a heart healthy diet centred around eating whole foods rather than the emphasis being on nutrients. “Eating patterns such as the Mediterranean, DASH or the UCLP© diets result in the consumption of a nutritionally appropriate diet. This is characterised by eating plenty of vegetables, fruits, wholegrains, vegetable proteins such as nuts and soya, seeds, vegetable oils and spreads. In those who consume animal proteins, the inclusion of low fat dairy, lean and largely unprocessed meat and white and oily fish and seafood are recommended. As oil-rich fish is an excellent low saturated fat protein source, and the main dietary source of long-chain omega-3 fats as well as other crucial nutrients, it should continue to be part of dietary guidelines. Additionally, for those wishing to follow a more plant-based diet, it’s reassuring that the report finds consumption of the shorter chain omega-3 fats found in plant foods (like rapeseed and soya oil) has cardio-protective qualities. This supports findings from population studies that vegetarians and vegans have a lower incidence of cardiovascular events and mortality compared to non-vegetarians. Lower the amount of food eaten which is high in saturated fat and replace it with foods high in unsaturated fats (which Cochrane’s 2015 review supports, SACN 2017 Saturated fat draft guidance). Increase our intake of fibre (especially from beans, pulses, oats and barley), nuts. Consume at least five servings of fruit and vegetables daily. Reduce intakes of red meat and avoid/limit processed meat. Consume two portions of fish weekly – one of which should be oil rich. Increase intakes of leaner and plant-sources of protein. Use sterol or stanol fortified products (if blood cholesterol is raised after other dietary changes have been made). It’s interesting to note that, unlike the US, the UK does not (and has never) recommended taking dietary supplements of omega-3 fish oil. Abdelhamid A, Brown T, Brainard J et al. Omega-3 fatty acids for the primary and secondary prevention of cardiovascular disease. Cochrane Database Syst Rev. 2018;7:10. Hooper L, Martin N, Abdelhamid A et al. Reduction in saturated fat intake for cardiovascular disease. Cochrane Database Syst Rv. 2015;(Issue 6):Art. No. : CD011737. Rizzo N, Jaceldo-Siegl K, Sabate J et al. Nutrient profiles of vegetarian and non-vegetarian dietary patterns. J Acad Nutr Diet.. 2013;113(12):1610-9. Sobiecki J, Appleby P, Bradbury K et al. High compliance with dietary recommendations in a cohort of meat eaters, fish eaters, vegetarians, and vegans: results from the European Prospective Investigation into Cancer and Nutrition-Oxford study. Nutr Res.. 2016;36(5):464-77. Springmann M, Godfray H, Rayner M et al. Analysis and valuation of the health and climate change cobenefits of dietary change. Proc Natl Acad Sci U S A.. 2016;113(15):4146-51. Clarys P, Deliens T, Huybrechts I et al. Comparison of nutritional quality of the vegan, vegetarian, semi-vegetarian, pesco-vegetarian and omnivorous diet. Nutrients.. 2014;6(3):1318-32. Cochrane is an established body of researchers, health professionals and patients across the globe renowned for their high quality scientific reviews of nutrition and health evidence. One in two people in the UK will be affected by cancer at some point in their lives. 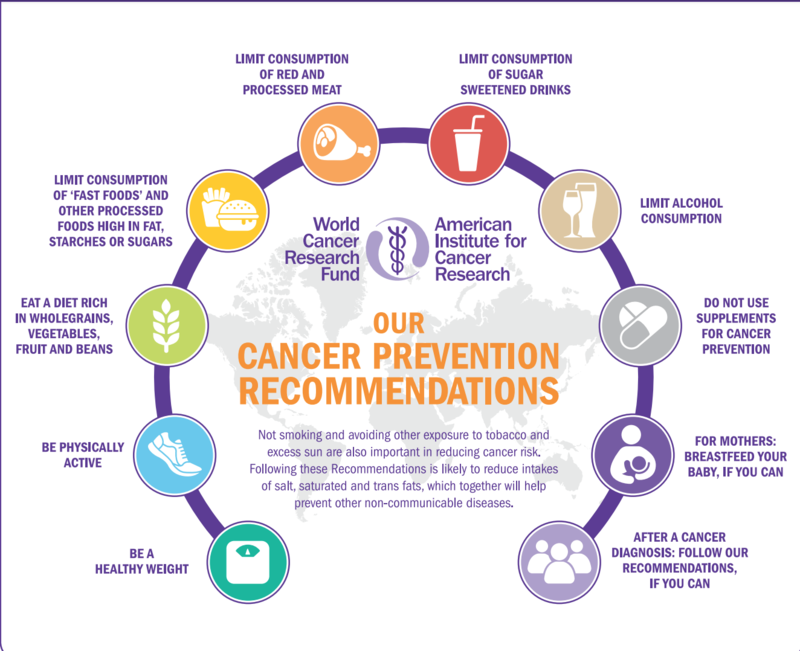 The important new expert report by the World Cancer Research Fund (WCRF) has been published, evaluating the links between diet, nutrition, physical activity and cancer and the past decade of cancer prevention research. It finds that around 40% of cancers could be prevented by making healthy lifestyle choices. Here’s a summary of the key findings, along with WCRF recommendations about how we can best help prevent cancer. There is strong evidence that greater body fatness is a cause of many cancers – including pancreatic cancer, liver cancer and ovarian cancer. Science in relation to the link has grown over the last decade.Rates of overweight and obesity have been rising in most countries. Figures released on obesity just this week show that in the UK almost 60% more children in their last year of primary school are classified as ‘severely obese’ than in their first year.WCRF says that if current trends continue, being overweight or obese is likely to overtake smoking as the number one risk factor for cancer. Whilst greater weight gain in adulthood increases the risk of post-menopausal breast cancer, evidence showed that being overweight or obese as an adult before menopause decreases the risk of pre-menopausal breast cancer. Also, being overweight or obese between the ages of 18 and 30 years decreased the risk of pre- and postmenopausal breast cancer.Despite the findings, it is important to know that WCRF recommend maintaining a healthy weight throughout all stages of life. WCRF Expert Panel opinion – Keep weight within the healthy BMI range (18.5kg/m2 – 24.9kg/m2) and avoid weight gain in adult life. WCRF explain more about BMI and provide a useful BMI calculator. Wholegrains and other foods containing dietary fibre decrease the risk of colorectal cancer. This includes both foods that naturally contain fibre and foods that have had fibre added. Beta-carotene in foods or supplements is unlikely to have a substantial effect on the risk of prostate cancer. Foods contaminated by aflatoxins (toxins found in some fungi) increase the risk of liver cancer. Find out more about what this means on the WCRF website. Foods preserved by salting increase the risk of stomach cancer. WCRF Expert Panel opinion – For wholegrains and other foods containing dietary fibre, the evidence shows that, in general, the more people consume, the lower the risk of some cancers. We are advised to consume at least 30 grams of fibre per day (see the fibre fact sheet from the British Dietetic Association for more information on how to achieve this). A diet high in all types of plant foods is recommended including at least five portions of vegetables and fruit per day. This poster from WCRF shows what counts as a portion. 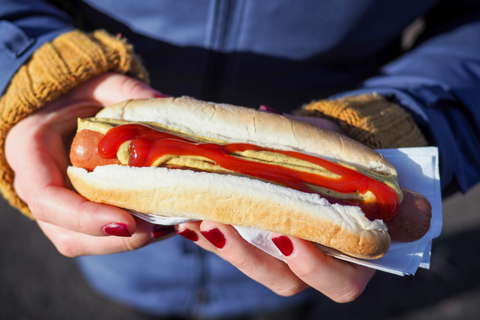 Red meat and processed meat increase the risk of colorectal cancer. Cantonese-style salted fish increases the risk of nasopharyngeal cancer. Dairy products decrease the risk of colorectal cancer. WCRF Expert Panel opinion – For people who eat meat, limit consumption of red meat, such as beef, pork and lamb, to no more than three portions per week: 350–500g cooked weight. Eat little, if any, processed meat. Two or more alcoholic drinks a day increase the risk of colorectal cancer. Three or more alcoholic drinks a day increase the risk of stomach cancer and liver cancer. Up to two alcoholic drinks a day decrease the risk of kidney cancer (though note, WCRF advise that this is far outweighed by the increased risk for other cancers). WCRF Expert Panel Opinion – The evidence shows that, in general, the more alcoholic drinks people consume, the higher the risk of many cancers. WCRF advise that for cancer prevention, it’s best not to drink any alcohol at all. Indeed, there is no threshold for the level of consumption below which there is no increase in the risk of at least some cancers. WCRF Expert Panel Opinion – The evidence implies that, in general, the more physically active people are, the lower the risk of some cancers. We are advised to do at least 150 minutes of moderate intensity activity (examples include brisk walking, cycling, household chores, swimming, dancing) or 75 minutes of vigorous activity (examples include running, aerobics, squash, netball, fast cycling) per week. The report also covers links between cancer and other dietary factors (including glycaemic load, vitamin supplements and non-alcoholic drinks); height and birth weight; and lactation. For more information, see the summary report. The report includes 10 key recommendations for cancer prevention. Shown here as an overview infographic, there’s lots more useful detail in the report itself. For lifestyle factors as discussed within this report, incorporating the recommendations into our lives as a whole package, rather than just focusing on a few individually, will be the most conducive for cancer prevention. It is interesting to know that between 30-50% of all cancer cases are estimated to be preventable through healthy lifestyles and avoiding exposures to occupational carcinogens (substances capable of causing cancer), environmental pollution and certain long-term infections. Cancer Health Check – A new online questionnaire check has been launched to help individuals find out where they are doing well and where they could make changes to their lifestyle to help reduce the risk of cancer. Toolkit – WCRF have published a downloadable toolkit which shows key points from the report using lots of visual representations of the findings. Interactive Cancer Risk Matrix – This tool gives information on how different aspects of diet, as well as body weight and physical activity, might be linked to cancer risk based on the strength of the evidence. Individual sections of the report – these can be accessed digitally as PDFs or as toolkits. This allows us to zoom in on specific dietary factors or different cancers and find out the evidence from the main report. This week, Public Health England (PHE) published their first assessment on the government’s sugar reduction programme, introduced to help reduce rates of childhood obesity. The food industry – including retailers, manufacturers, restaurants, cafes and pub chains – was given the target to cut 20% of sugar from a range of products by 2020, with a 5% reduction in the first year. The first year of the programme was from August 2016 to August 2017. What does the assessment show? Retailers and manufacturers have achieved only a 2% reduction in sugar. Sugar has been reduced by 11% by retailers and manufacturers in drinks that are included in the Soft Drinks Industry Levy and average calories per portion has been reduced by 6%. New guidelines have been published for the drinks industry to reduce sugar in juice and milk-based drinks. Importantly, PHE highlight that there are forthcoming sugar reduction plans from the food industry and that some changes of products were not captured in the data (as the changes took effect after the one-year mark measured). This all points towards hopefully seeing greater reductions in future assessments. Reductions in sugar levels were seen across five of the categories. Yogurts and fromage frais, breakfast cereals, and sweet spreads and sauces have all met or exceeded the initial 5% sugar reduction ambition. Biscuits and chocolate confectionary have seen no change at all in sugar levels. The puddings category has actually seen a slight (1%) increase in sugar content overall. It has been noted that for the eating out of home sector, portion sizes in products likely to be consumed in one go are substantially larger (on average more than double) those of retailers and manufacturers. Calories in products likely to be consumed in one go have reduced in four categories. Of these, ice cream, lollies and sorbets, and yogurts and fromage frais have reduced average calories by more than 5%. Often this is due to smaller portion size. 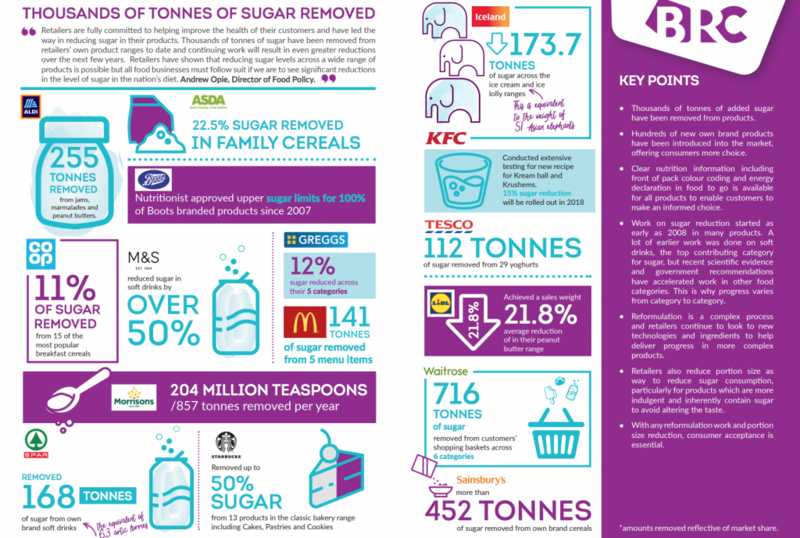 The British Retail Consortium (BRC) provided an interesting infographic showing how the food industry has been cutting sugar. In response to the PHE assessment, Andrew Opie, Director of Food Policy at the BRC, stated: “Retailers are fully committed to helping improve the health of their customers and have led the way in reducing sugar in their products. Thousands of tonnes of sugar have been removed from retailers’ own product ranges to date and continuing work will result in even greater reductions over the next few years. Reduce sugar in juice-based drinks by 5% (excluding single juice – that is, products with juice from a single fruit with nothing added to it). Cap all juice-based drinks (including blended juices, smoothies and single juices) likely to be consumed in one go to 150 calories. Reduce sugar in milk (and milk substitutes) based drinks by 20% and cap products likely to be consumed in one go to 300 calories. Some progress has been made, but it seems we’re still well off hitting targets for sugar reduction. It’s clear that more work is needed – by manufacturers and retailers, but also cafes and restaurants, where calorie intake tends to be significantly higher. The next progress report from PHE is due in Spring 2019 and should give a clearer picture on the programme’s progress. Of course, this is only one of the many strategies needed to help combat the obesity crisis. Along with the BDA and many others, we’re looking forward to hearing government measures for issues including broadcast advertising, in-store promotions and other interventions to help tackle the problem. Fruit juice and sugar: the truth? The new sugar tax on soft drinks excludes fruit juices, as they are legally labelled as having ‘no added sugar’. With child obesity levels ever-increasing, especially among lower socio-economic groups, this worries us. It also highlights the increasingly frequent and often damaging disconnect between legislation, nutrition science and public health guidance. Fruit juice is a liquid form of ‘free sugars’, with little of the fibre naturally found in fruit. Additionally, some of the essential vitamins present in fruit juice such as B vitamins, folate and vitamin C are added to fruit juice at the end of processing. So the perception of it as a ‘naturally healthy’ drink is misleading. With fruit juice packaging labelled with ‘no added sugars’ and the government’s ‘counts as one of your five a day,’ it’s not surprising that consumers perceive fruit juice as better for you than sweetened soft drinks. EU law permits 100% fruit juice that does not contain any other forms of ‘added sugars’ to be labelled as having ‘no added sugars’. That sounds logical, right? Except it clashes with the World Health Organisation (WHO) and Public Health England (PHE), who both classify fruit juice as a source of ‘free’ sugars. This is because structure of the fruit has been broken down to release sugars in their free form, which behave in the same way in the body as other forms of more commonly understood ‘free’ sugars, for example table sugar. Like fruit juice, table sugar is simply a result of extracting/freeing naturally occurring sugars from the structure of the beet or cane plant. The most recent PHE publication in March this year makes things crystal clear, ‘[Free sugars are] all monosaccharides and disaccharides added to foods by the manufacturer, cook or consumer, plus sugars naturally present in honey, syrups and unsweetened fruit juices’. Despite this clear scientific reasoning on sugar, PHE continues to permit 150ml daily allowance of fruit juice to count as one of your five a day. This is based on the fact that the UK continues to under-consume whole fruit and vegetables, which are critical to meet our essential vitamin C and potassium requirements. Fibre: fruit juice 0.1 – 0.9g per 150ml (even one with ‘bits’) vs a medium orange at 1.9g. Free sugars: fruit juice 12.3g vs none in a medium orange. In terms of free sugars, weight for weight there’s little difference between fruit juice and soft drinks. Studies looking at fruit juice intakes and impact on health proved challenging for SACN when reviewing their recommendations. Evidence for fruit juice and impact on health was found to be lacking, inconsistent and / or of poor quality. If everyone was to keep to 150ml of a sweetened liquid per day, there would be no issue with fruit juice or sweetened beverages. The problem is, this official advice is given to a nation where it has been found that only 1% of the UK population achieve healthy eating recommendations.This 150ml of sweetened liquid per day will in reality not be followed or achieved by the majority. Not least because it’s difficult to keep to 150ml of fruit juice when, in the main, it is sold in 200ml and 1litre cartons, and most household glasses are around 200-250ml. 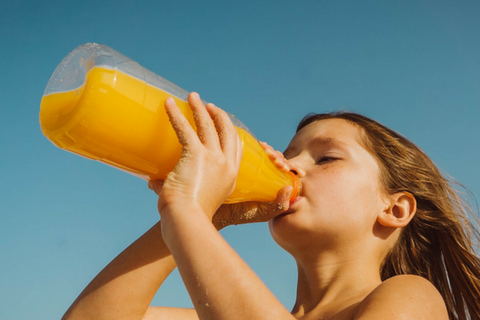 According to the government’s 2018 National Diet and Nutrition Survey, fruit juice remains the number one free sugars contributor for 1½ to 10 year olds. This is highly indicative of mum’s perception that fruit juice, unlike sweetened soft drinks, is ‘natural’, has ‘no added sugars’ and therefore good for their children. During teen years, sweetened beverages takes prominent first place. Fruit juice drops down to third position but still contributing to almost 10%. It’s not just weight that’s an issue. The UK has one of the highest incidence of dental caries globally. Dental health is dependent on multiple factors, including the frequency and timing of sugar consumption and length of time teeth and gums are exposed to acidic and sugary foods. Both fruit juice and sweetened beverages are acidic and contain large amounts of ‘free sugars’. They are therefore not recommended by the British Dental Association (BDA). If fruit juice is to be consumed, the BDA recommends diluting it – 1 part juice to 10 parts water. Despite a common misconception around whole fruit, the BDA highlights that fruit, although acidic, is not a risk to dental health except when consumed in unusually large quantities. The bottom line is that consumers need to be aware that there is little difference between sweetened beverages and fruit juice when it comes to tooth decay. The recommended drink by all health organisations is either water or milk for optimum health. Free sugars are not essential for human health. Due to our over-consumption, they have become a major contributor to our calorie over-consumption. However, it would be unrealistic to avoid them altogether, and if consumed in moderation as part of a healthy, balanced diet and lifestyle, there should be no problem at all. The government has set maximum recommended intakes for all ages. In the context of the current health state of our nation, consumers are struggling with the ‘in moderation’ and ‘balanced diet’ (otherwise obesity and obesity-related diseases would not continue to escalate).We are at crisis point with our unhealthy choices, which are having untold preventable health and economic impacts. People need clearer advice and support to stop over-consumption and have a healthier understanding and relationship with food and drink. When it comes to fruit juice, we believe it’s time to start promoting the benefits of consuming real fruit, which provide so much more nutrition, contain no free sugars and very unlikely to be over-consumed. The law should change to take into consideration international and national classifications of ‘free’ and ‘added’ sugars. Will the new sugar tax work? This month, the much anticipated sugar tax came into force in the UK. So what it is, why was it introduced and – most importantly – will it have any impact? 24p per litre if it contains 8g of sugar per 100ml. The tax does not apply to milk-based drinks, due to their calcium content. It also excludes fruit juice or vegetable juice that don’t have added sugar. 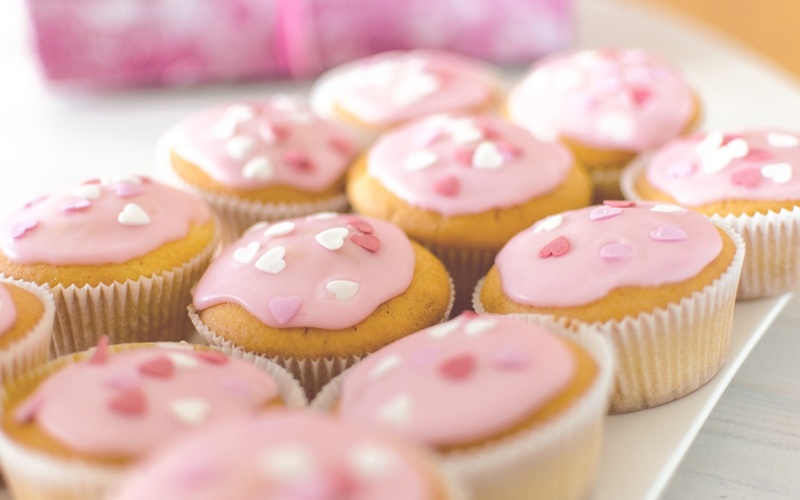 Foods such as cakes, biscuits and other sugar containing foods aren’t covered, but there is a separate initiative to reduce their sugar content by 20% by 2020. The tax has been introduced in an effort to tackle childhood obesity. The latest National Diet and Nutrition Survey (NDNS) showed that sugar-sweetened drinks are the single highest source of free sugars for children and teenagers. This is why soft drinks have been targeted. Fanta – reduced sugar from 6.9g (a little under 2 tsp) to 4.6g (just over 1 tsp) per 100ml. Ribena – from 10g (2.5 tsp) to less than 4.5g (just over 1 tsp) per 100ml. Lucozade – from 13g (just over 3 tsp) to less than 4.5g (just over 1 tsp) per 100ml. Irn Bru – from 10.3g (2.5 tsp) to 4.7g (just over 1 tsp) per 100ml. Others remain the same, for example Coca-Cola (10.6g per 100ml, just over 2.5 tsp) and Pepsi (11g per 100ml, just under 3 tsp). These manufacturers have to decide whether to bear the cost of the tax increase themselves, or pass it on to consumers. In one leading supermarket, the cost of a 2L bottle of Pepsi went up by 45p when the tax was introduced. 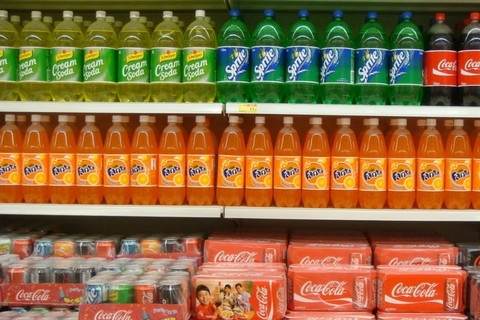 By contrast, Coca Cola kept the price the same but reduced the portion size: a 1.75L bottle has shrunk to 1.5L bottle. A survey by Mintel of 2,000 people found that just under half (47%) of Brits say that a tax making unhealthy food or drink more expensive would encourage them to cut down on these items. So the measure will hopefully have some effect. It’s extremely positive that some food manufacturers have already taken action to reduce the sugar content of their recipes. However, the feedback hasn’t always been positive about the new taste of much-loved products (reduced sugar Lucozade and Irn Bru, for example). And a significant proportion of people will simply pay more for the same recipe high-sugar drink they’ve always enjoyed. We’re also concerned that drinks that fell outside of taxable products, such as fruit juice, often still have high levels of free sugars. The National Health Service discusses maximum intakes of free sugars for all ages. Drinks manufacturers have made an initial decision on whether to reduce sugar levels to avoid the new taxation or to leave sugar levels unaltered. They’ll be closely monitoring orders from retailers to assess the effectiveness of their initial decision. If it proves that sales of reduced-sugar drinks increases, other manufacturers may be keen to follow suit. Drinks retailers will need to carefully monitor demand for those reduced-sugar drinks vs unaltered recipes that are subject to the tax, to satisfy any changes in demand. The Mintel research found that three quarters of consumers say that easier-to-understand nutritional information on product packaging would encourage them to cut down on unhealthy food/drink. We’d love to see improved labelling too, to see what the impact could be. It’s going to take months and years to assess the impact the tax has on the nation’s health. And, of course, obesity is caused by many factors. Clearly multiple strategies including education will be needed to combat the problem. We’ll be monitoring closely to see whether the action has any impact on those most affected by obesity – those in the lower socio-economic bracket and children. Do you agree it’s a step in the right direction? Should the Government be focussing on something else to better address the problem?